First of all, congratulations on qualifying for the 2012 World Amateur Go Championship! This will be your fifth time representing Romania; what are your goals for the tournament? Thank you. Actually, this is my 6th time in the WAGC (the 2003 edition was organized in Korea instead of Japan because of SARS); I hope to finish in the top 3 to make a legendary result for Europe and the Western Go World. Could you please describe to us your preparation process for the WAGC? Do you use any Go analyzing programs? Many of the top Romanian Go players used to be insei for some time: Cristian Pop, Ion Florescu, Sorin Gherman, Dragos Bajenaru... Have you considered the possibility of becoming an insei yourself? Yeah, I dreamed about it in the past but I didn't have the possibility to become an insei in Asia so I had to study the game by myself. Luckily, Internet Go helped me a lot from 1998 when I first joined IGS and played like 30-40 games/day. for Europe and the Western Go World." Let's go back in time. When and how did you learn how to play Go? Did the game captivate you right away? In 2005 you reached the rank of 9d on KGS. What was the determining factor of your improvement? Well, I was already playing the game for more than 10 years back in 2005 and I took part in many Go tournaments in Europe, but playing like a maniac online was really helpful. What role does Go play in your life? How important is it? You are one of the most successful teachers on KGS. What would be your advice to young people who are just starting to play Go and take it seriously? It is important to play the game with joy and keep studying all the time; even as a high dan player, there is always room to improve. if I don't count my 6-year-old daughter"
In your opinion, what is the best Go server out there? Tough question... Back in the day, IGS was great; it was like love at first sight for me. Then KGS became more and more popular in the last 10 years, but recently Wbaduk and TygemBaduk are also very interesting to watch pro games and play strong Korean and Chinese players, so it's pretty hard for me to choose one as I am using all of them. Who do you think is the strongest player on KGS? What is your greatest Go achievement(s)? Probably my 5th place in 2008 WAGC and becoming National Champion with a perfect score (7-0) which is pretty tough in Romania when playing against great players such as Cristian Pop 7d or Dragos Bajenaru 6d. What are your thoughts on the "European Professional Go League"? That's a very good idea, we should start it soon but it will still take a while to improve our Go in Europe to be competitive in big international tournaments vs. pros from Asia as it was the Mind Sports Games in China last year. Anyway, I am sure a Pro League in Europe will be very motivating for the current top players and also the young talented players who are rising nowadays. and keep studying all the time"
What is the one thing about Go in Europe that you would like to see different? What do you feel are the best instructive Go books available in English? Long time ago when I read Go books I was very fond of "Lessons in the Fundamentals of Go" or "Basic Techniques of Go", but there are many others like "Direction of Play", "36 Stratagems Applied to Go" , "Strategic Concepts of Go" and so on... It helps to read them all but in order to develop your own style of play it is best to replay pro games on a regular basis. 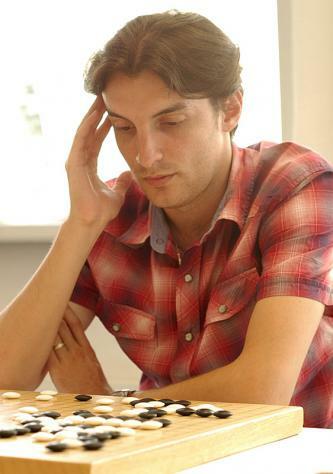 What was your worst moment as a Go player? What are your favorite places you've ever visited during your Go travels? Hard to decide, there are so many beautiful places all over the world, I enjoyed most of the big cities in Europe like Paris, Amsterdam, London or Barcelona but also Beijing, Seoul and Tokyo in Asia or Chicago and San Francisco in the US. players than Asians in events like EGC..."
Who will win the European Championship this year? If you plan to take part, what do you think about your own chances? Heh, I don't know, both you [Alexander Dinerchtein] and Ilya are the big favorites in the EGC, and so is Catalin if he plays or Artem; I will play too and hope to finish at least in top 8 as last year... The EGC is getting tougher these days with all the strong young players like the Mitic brothers, Fredda and Ali around. What happened with Romanian Team on Pandanet Team Championship? Why did Catalin Taranu, 5p ignore this event and did not help your team? Do you also play in different server aside from KGS? Yes, IGS, Wbaduk and TygemBaduk as mentioned above. Who are your favourite european players (amateurs and professional) and asian players (ama and pro)? Among European players I go with Catalin [Taranu] 5p; as for top pros, there are so many good players... if I have to give a few names, I'd choose Takemiya Masaki and Cho Chikun of Japan, Lee Changho and Sedol of Korea, Gu Li and Kong Jie from China. Do you think you be a pro someday? Do you also play chess or other board games aside from go? but during slow games one can find much deeper ideas"
At your level, what kind of training do you think is the most helpful? It is always good to solve tsumego to keep your reading skills sharp, but I am pretty lazy with that; I usually check life and death on my iphone while travelling for tourneys J replaying pro games I do often but mostly on the PC, not on a real goban, so I can check more games pretty fast and that can always give me some new ideas; that helps at any level. What do you think about teaching go, do you see yourself improving, or the opposite? When I started to teach back in 2000 I was already 5d EGD and it helped me improve because it made me have a more serious approach to the game. What do you think is missing to european players to be of the level of an asian player? Aggressively, Reading capacity(semeai, sabaki...)? First of all, we don't have the same Go environment as in Asia; I think the main problem we should focus on is basics and fundamentals though. Do you like fast byoyomi games(20s), or do you prefer long matches(3hours each)? What are the benefits of these matches? I can play both fast and slow, when online I prefer fast games but in tournaments I can enter byo yomi even if we start with 2.5 hrs like in the EGC. Playing fast is good to test your Go instincts but during slow games one can find much deeper ideas. What kind of playing styles do you like, and which ones are you interested in playing? I'd like to think that I am pretty much a "free style" player, I don't like to start playing the same pattern on and on and I sometimes play for influence, sometimes very territorial, it depends a lot on the opponent too.. I remember that you were on IGS before moving to KGS, on internet which servers do you think are going to be the most popular in the future? Both IGS and KGS are great servers for English speaking users but the Korean servers are more and more popular since they also set up an English interface. but I prefer to be one of the strongest amateurs instead"
What are your hobbies away from Go? who of the uprising european players is interesting for you/ is an real opponent for you? All the young players like Artem, the Mitic brothers, Ali and Fredda are very challenging opponents. And do you like Cash or influence as starting position? "...it's a lot about balance." What areas of your game were you focusing on improving at 6kyu/2kyu/1d/3d/5d etc.? Well, in the beginning I was just focusing on killing more stones than my opponent did, and I didn't care much about strategy... It was just tactics all the time till I was like 5-6k, then after reading some Go books I start to focus a bit more on fuseki judgment and joseki studies from 2k to 1-3d; later, I used to replay many pro games on a real goban and the main focus was tenuki and using initiative to go for bigger moves all the time; but you can't just play the game being good at fuseki or yose, you've got to be able to play decently during all stages of the game... it's a lot about balance. What a neat subculture I am getting myself into. I really hope that I can get better and help to spread the love of this game. Thank you DanielTom for taking the time to do neat interviews like this and inspire players like myself. Update: Cornel took 11th place in the WAGC 2012.
thanks for your time and answers! good interview.